Fujisaki Girls Academy is known as an outstanding school for all things prim and proper and the student body president, Natsuo Maki, is the perfect example of those things. Except, tomboy Riko discovers that Maki isn’t as “put together” as everyone thinks she is when Riko accidentally catches her making out with a life-size huggie doll for practice. Now, Riko is forced to keep a secret as she has been drafted as Maki’s aide and advisor in love and romance! Two girls: the student council president and a girl they call "Wild Kid" learn about love…sort of. Episode 2: The Shy, the Cool, and the Perverted? The former student council president and treasurer want their jobs back, and will go to great lengths to oust Maki from her presidency. Maki collapses after overworking herself. In order to even out the workload, the rest of the student council decide to parley with the enemy to reach compromise. The student council has reveived an anonymous letter asking them to find out what to get a guy on his birthday. Riko, the appointed "love sniper" is on the case. The student council launch into their plan to answer the anonymous request through the school's PA system. Later, Riko sinks deeper into her lie. A childhood friend or Riko's returns, but Riko has no idea who he is. Later, romantic advice requests begin flooding into the suggestion boxes. Episode 7: To the Kurahashi House! 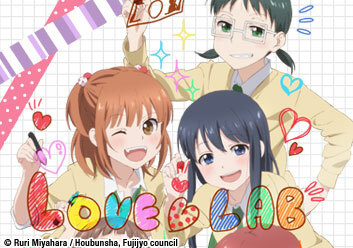 With Momo and Nana watching the student council's every move, it'll be difficult to hold more Love Labs. The group decides to head to Riko's house, where a flustered little brother meets the woman of his dreams, the elegant and graceful Maki…or so he thinks. Riko and Maki find out about their school wide nicknames, and Riko is none to happy about hers. Momo and Nana push to have the Newspaper association turned back into a club through shady means. Mizushima takes the fall for being caught with her boyfriend and quits the Student Council. Maki devises an intricately genius/stupid plan to save Mizu. Riko, Maki and the girls decide that Mizu needs a disguise to keep going on dates, and Maki pulls out her collection of costumes. Later, brother drama and Suzu cuteness! A new request about guys's favorite hairstyles for girls shows up, and the student council is on the case! Maki does after hours research. The student council moves to have the newspaper association's underground paper be their Love Lab column. Later, Riko decides to confess her lie to Maki. Maki has been acting strange, and Riko knows why. In order to save their friendship, Riko steels herself and confesses her big secret to her friend.